I’m embarrassed to admit this, but up until last weekend, I had never oven-roasted garlic. My chef husband probably judged me for this. Luckily he was at work while I was playing in the kitchen so he missed the huge mess I made. I can saute garlic like a champ, but now, after trying the roasted variety, I don’t know if my life will ever be the same. Seriously. I may or may not have stood over my oven, shoveling an embarrassing amount of baguette into my mouth and burning my fingers as a result of not wanting to waste any of this delicious-ness that didn’t make it into the above mentioned pesto. It happens. Do you see all the delicious-ness in the pan?! If you’ve never roasted garlic, here is an excellent tutorial, courtesy of the Pioneer Woman. It’s crazy easy and totally worth it. I must note, that I only roasted my garlic for about 30 minutes, but I think it’s because my oven is possessed and chooses its own temperature… but that’s a different story… Moral of this story, use your best judgment for roasting times. 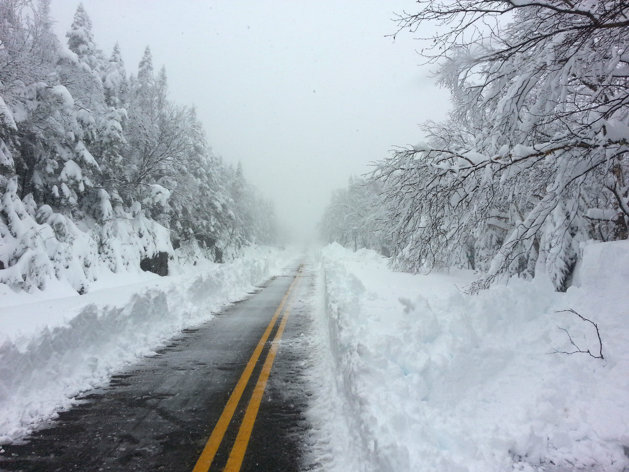 Luckily, I missed the snowfall. And just got stuck with wind, rain and cold. And it was in this lovely weather that I ventured outside to pick arugula from the garden. Brilliant, I know. But I had to… I had pesto on the brain. And it was totally worth it. 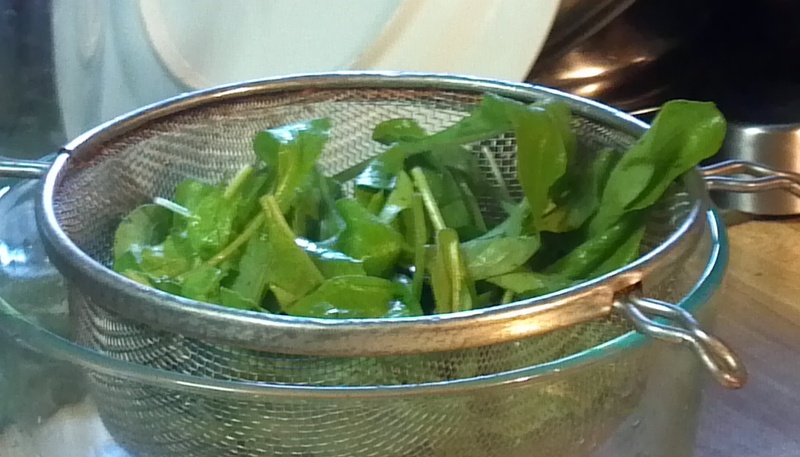 Rinse spinach and arugula and let dry. 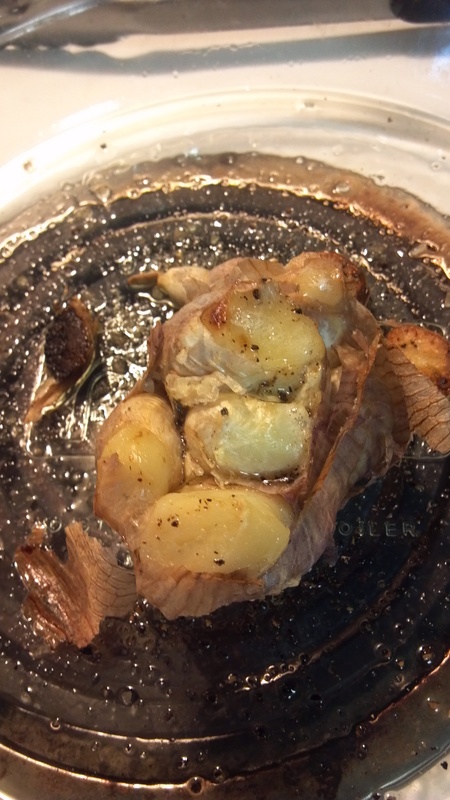 Roast garlic (if necessary, see tutorial link above). Once garlic is cooled, gently squeeze cloves out of the skin (also in tutorial). Put all ingredients in a blender. Pulse until smooth. The pesto will be perfectly delicious at this point. So you can serve over warm pasta with or without lots of parmesan cheese, spread on a baguette…or store in an airtight container in the fridge until ready to use. Goat Cheese, about 4 oz. 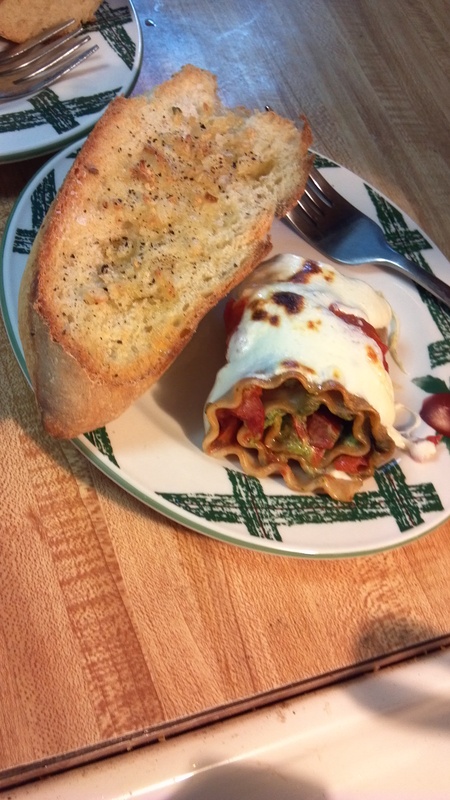 Cook lasagna noodles according to package, drain and lay out on a cookie sheet to dry/cool. 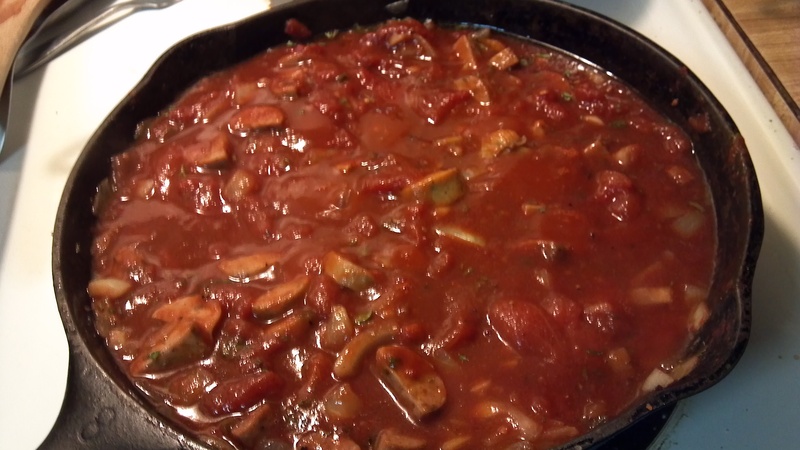 Prepare a large casserole dish by putting a thin layer or diced tomatoes or tomato sauce in the bottom, set aside. 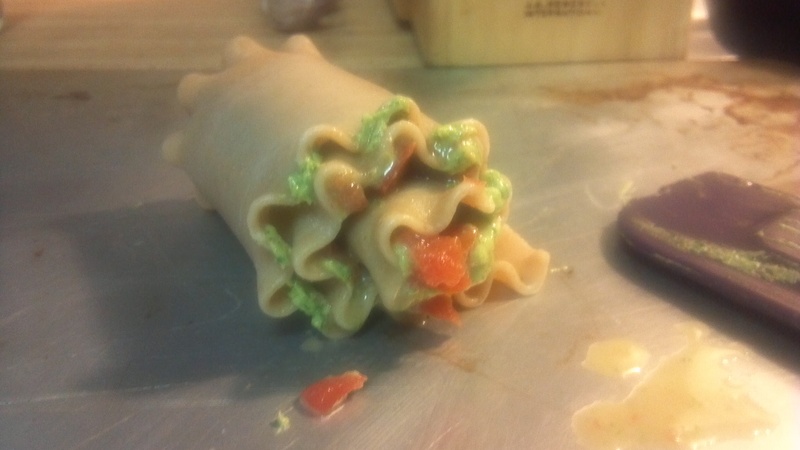 Using a rubber spatula, spread pesto-goat cheese mixture along 2/3 of the lasagna noodles, as pictured below. 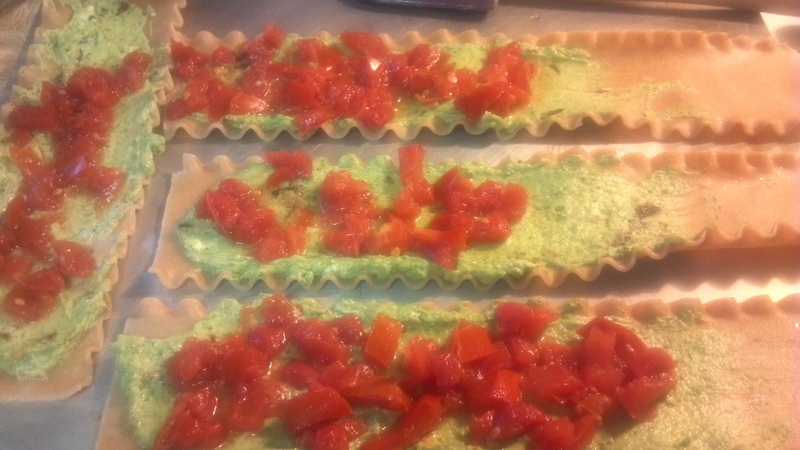 If using diced tomatoes, sprinkle those on as well (be sure to drain so they don’t get soggy). Place prepared noodles, open-end down, in prepared casserole dish. Top with leftover diced tomatoes. Bake for 20 minutes, covered. Uncover and bake an additional 10-15 minutes or until noodles are hot. If using cheese, add at the same time as you top noodles with diced tomatoes. Follow same baking instructions. Bake until cheese is browned and bubbling. Makes about 5 servings (2 rolls per serving). I’ve been really into salads lately. Farmer Ben and I went grocery shopping on a rainy Monday night because I desperately needed to eat something green. We purchase Olivia’s Organics brand when the greens are out of season, they are an (awesome) east-coast based company. Check them out! Since Monday, I’ve eaten approximately 47 salads. Now, I know this sounds crazy. But I get creative. His & Hers Salads for lunch. Yesterday, my salad consisted of leftover chicken, avocado, tomato (grown in VT! ), radishes, red onion, sprouts, a Serrano or two…and some spring mix/spinach as an after thought. I can totally fit more in this bowl. You see, I belong to the school of thought that believes that the salad is not about the lettuce. It’s about the toppings. Some days, I’ll cover my greens with bleu cheese, other days, I’ll pick seeds, nuts and other crunchy goodness… Lately, I’ve been loving Serrano peppers and cranberries. Tomorrow it could be steak. Most of the time I have so much on my salad that I don’t even use dressing. That would be overkill. I guess I’m just trying to say that salad is delicious. Today, my greens are covered in a tasty pasta salad and a few other veggies. I opted to use olive oil instead of mayonnaise (mayo would work just as well and probably be more just as delicious) to make it a bit healthier. And per usual, I didn’t really measure, so this recipe is more of a guideline. *Makes about five 1-cup servings (because if you’re like me, you usually have seconds). About 8 oz (half a box) of pasta uncooked. I used elbows. 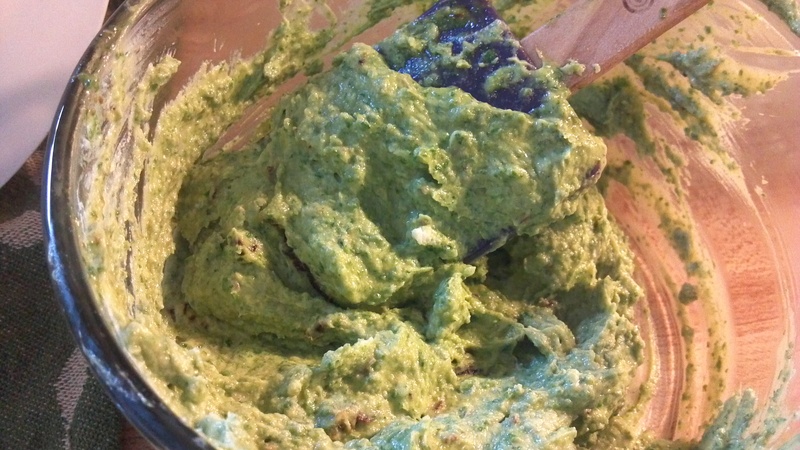 Green Olives, pits removed and chopped, about 1/4 cup…or more. Cook pasta according to package. Drain and let cool (I stuck mine in the fridge to speed up the process). In a large bowl, combine all ingredients. Using a fork, be sure to break-up tuna fish and stir. Loving all the green, yellow and red! Serve over a giant salad, as a side dish, or… right from the bowl. I love pasta. I don’t know if it’s my Italian roots or the fact that you can put pretty much anything in it and have it taste good, or something else… whatever it is, pasta makes life better. I also love red wine. One of my favorites is Seven Deadly Zins (it’s a red zinfandel by the Lodi Brothers). Chop onion, garlic, and basil. Set aside. In a large skillet/pot, add olive oil, bring to medium heat. Add onions, cook until softened. In the mean time, chop up your chicken sausage-if you’re using it. Add garlic and chicken sausage to the pan. Let cook for a few minutes, stirring once or twice. Pour in can of tomatoes-do not drain! 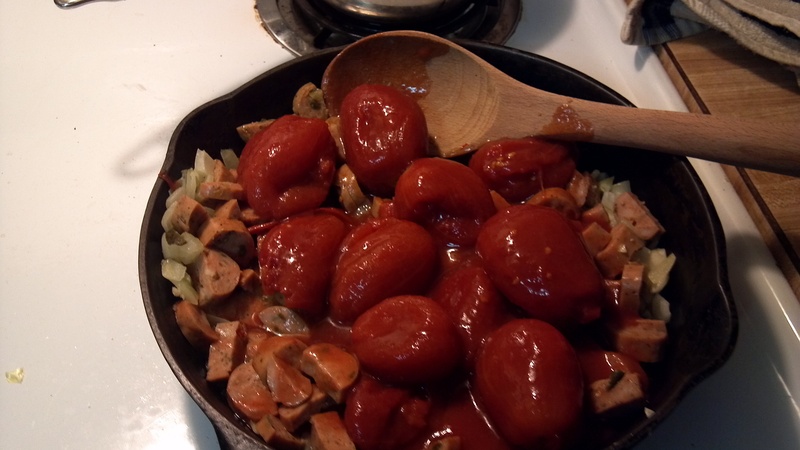 Using your spoon, crush tomatoes up, leaving a few chunks (If you don’t like chunks, you can also puree the tomatoes before adding them to the pan.) and stir into mixture. After a few minutes, add a few good glugs of wine (I’d say somewhere between half and three quarters of a cup) and stir. Next, add in your can of tomato paste and the basil. Stir the mixture until combined. Sprinkle in oregano and parsley. If needed, add salt and pepper. Reduce heat to low and let simmer for 10-15 minutes (until some of the liquid is evaporated), stirring occasionally. 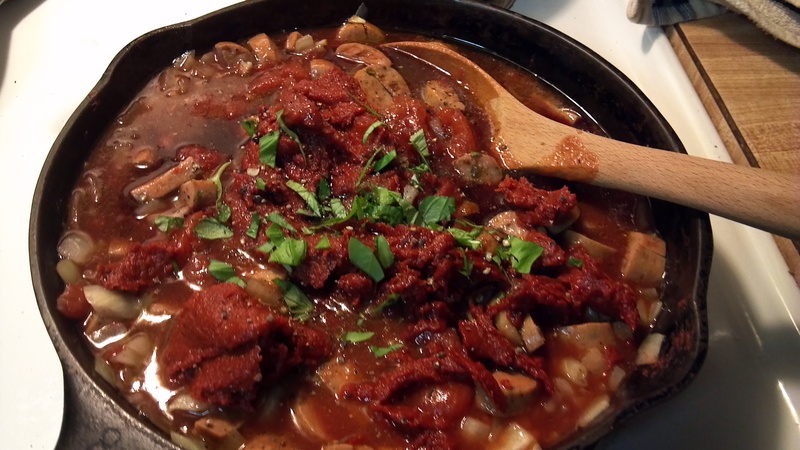 *For a more intense flavor, let simmer longer-just be sure to stir once in a while to avoid burning. 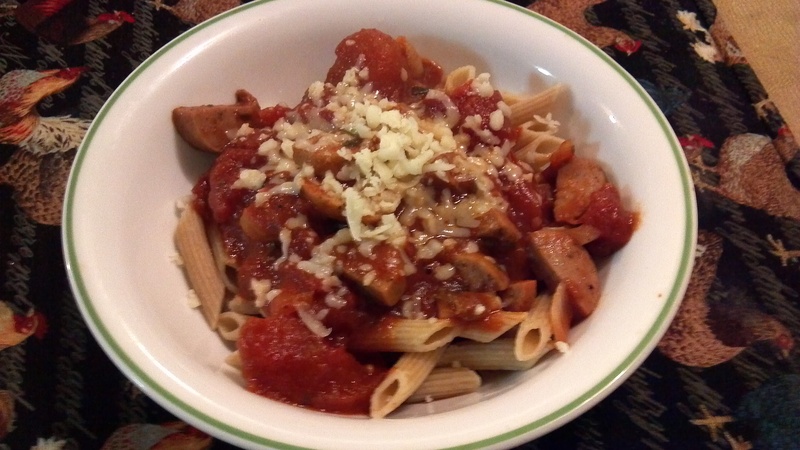 Serve hot over pasta- I used whole wheat penne with milled flax seed. Top with Parmesan cheese…or maybe some of that homemade ricotta? Dream come true! 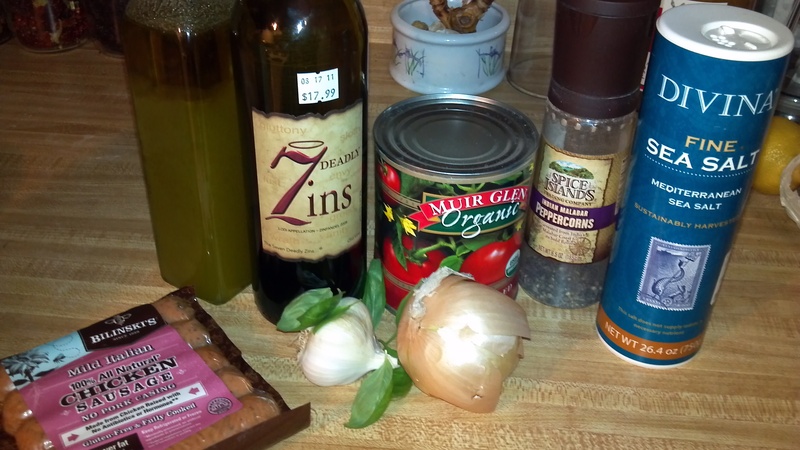 This sauce is savory enough that it can be made without meat, while still being versatile enough to pair with chicken, beef or sausage. The sky’s the limit! Topped with some mozz... yummo! Wow…this weekend went by way too fast! As I sit here on Monday morning, I am reflecting over all of the randomness that occurred. I mentioned looking for a part-time gig… Mission accomplished. I got a phone call Thursday night asking if I was interested in a hostessing position. I called them back on Friday and was told that I would be starting on Saturday-and btw, it was going to be very busy. Okay, no big deal. The bar was bumpin’ as it was the annual Toys for Tots party, but the dining room wasn’t very busy, which meant that I wasn’t either. It felt weird to be working on a Saturday night, as I haven’t done so since the summertime…and since I have only ever worked at one restaurant…as a waitress, not as a hostess, I think it will take a few weeks to get back in the groove. It made me nostalgic for the Rusty; running around like a crazy person, balancing martinis and a bottle of wine, pestering the kitchen to get my order out and taking a moment to look out the windows as the sun was setting over the lake and Valcour Island. That’s the thing I both love and hate about starting somewhere new… finding the rhythm of the new place, picking up on the vibe of the building and its people and figuring out where I fit into all of it. It was not a bad night. I came out unscathed and I am extremely grateful for the second job. My next shift is on Tuesday and I believe that I will have the rhythm of this place down…or at least I hope. On a less uplifting note, I also attended a funeral this weekend. It was a very sad occasion, but the family chose to celebrate his life and it spread to the other attendees. The man whose life we were celebrating was one of the regulars at the Rusty. He was a very particular man but he was one of my favorites, I was sad to hear of his passing. Apparently many others were too, there was not an empty seat in the church. Occasions like this always make me reflect on my own life, my loved ones and what God’s purpose for me is. I think about where I am and where I was…and wonder where I am going. I have to laugh, because one of the hymns sung at the funeral was “In the Garden.” It’s one of my favorites but I will never be able to sing that song or take it seriously ever again because of my ex. He always used to change the words of the song (“And he walks with me/ and he talks with me…) to “Andy walks with me/Andy talks with me…” and so on and so forth. Of course, during the service, while those around me were tearing up, I was trying not to crack a smile while I was singing. Please don’t judge me. I’m really not a bad person. It’s funny how little things like that keep you moving forward. I used to get so annoyed when he would reference that song and his little lyric change-up. Stupid memories/quirky habits (whether your own, your ex boyfriend’s or an old friend’s) that you used to hate come back in different forms and actually help you when you’re dealing with a difficult time. I hope that this man’s family will be able to draw from their own funny memories as they continue on their journey. From what I gathered, there were many. Sunday was our usual ritual of waking up late, rushing to get to church on time, devouring breakfast and coffee, Sunday School with the kids and then the service. Our service was about the Wise Men. It definitely got me thinking, once again, about purpose. There are so many things that I love to do. But I still haven’t found the thing that I want-or am meant- to do forever. I am a big believer in no regrets, everything happening for a reason/being part of God’s plan and so far it hasn’t failed me…though, I do admit, I have had a few major bumps along the way…which I will always refer to as learning experiences. Hopefully, one day I’ll be able to collect the entire sum of knowledge gained and put it to use…til then, I hope others will learn-and be entertained-just as much as I have from them. The rest of the day was spent with the hubs. We had some great sushi for lunch then braved the mall for a post meal calorie burning walk…this lasted about 20 minutes before I reached my limit of holiday mall madness and we headed home. The rest of the day was spent watching movies, writing thank-you notes and baking Amish Friendship Bread (Thanks Dana!). It was nice to relax after a pretty hectic week. I always enjoy Sundays because it’s our day to do whatever. I also made a pretty quick and easy pasta dish on Friday night. Your favorite pasta-I used the tri-color rotini. Cook your pasta al dente, drain and set aside. Using the same pot (on low-medium heat), add butter, chopped garlic and chopped sage. Melt butter, stirring occasionally. Grate in parmesan cheese-I put in about 1/4 cup. Continue to stir until cheese starts to blend in. Return pasta to pot. Stir until well incorporated. Crack an egg in. Mix well. Continue to stir until egg is cooked in (this should only take a few minutes, you’ll be able to tell by the texture. 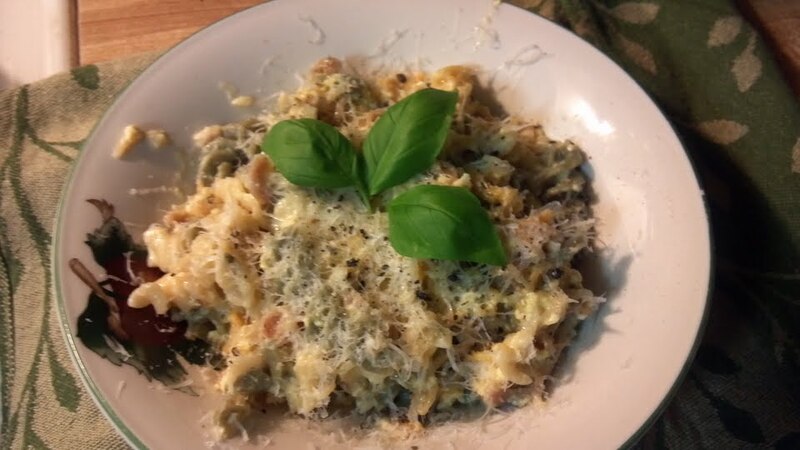 Serve Hot, garnish with a couple of basil leaves and more Parmesan cheese.. Anyway, hope everyone has a good week! Stay tuned for an awesome gift idea and my scheming as of late!